Who ever would have imagined, when all this began, that our Grab Bag of highsec miner tears would be so voluminous? We're on edition number twenty-six, and there's no sign of slowing down. When Knights of the Order gank Code violators, they typically send a form EVEmail to notify them of what happened. Our attacks are not random, after all. This is just a sampling of some of the replies we've received. sung Nortek reveals what we've known for some time now: Beneath a miner's silent, AFK exterior beats a raging heart. It only needs to be unlocked. Each carebear is different. Some, like Favorlock, get right to the point. ...While others are more meticulous in their tear production. 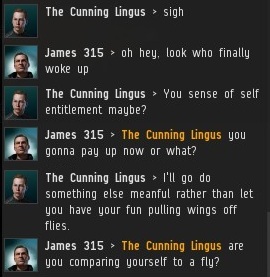 I had to bump The Cunning Lingus out of mining range before he was willing to participate in EVE. I wish it weren't necessary, but I refuse to play a single-player game. Kansas Winndu lifted my spirits. I'm not certain exactly what he meant, but whatever it was, I took it as a compliment. People have long hoped that I would appear at Fanfest. Do you think CCP would give me my own panel? SPIONKOP remains an interesting fellow. 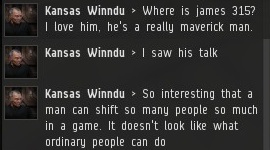 After all this time, he continues to follow the New Order around highsec. He doesn't do anything other than complain, though. 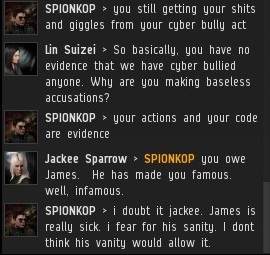 Perhaps if he calls us "cyber bullies" enough, we'll get banned? It worked against The Mittani, so why not? 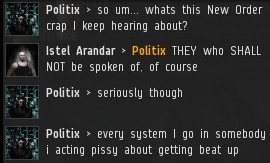 Speaking of Politix, he learned of us through our reputation. The halls of highsec echo with reports about our successful implementation of the Code. But we've still got a long way to go. The New Order is one of the great success stories of EVE. Where else can you find so many people willing to put aside their differences for the greater good? 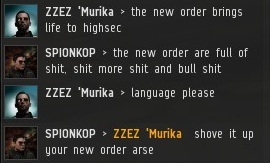 On occasion, rebels attempt to warn miners of incoming gank squads. They usually quit after watching AFK miners die a few times. 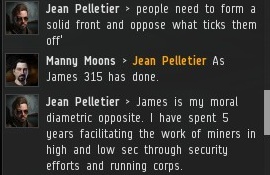 Jean Pelletier fancies himself the anti-James 315. Whilst I am efficient, Jean is very inefficient. 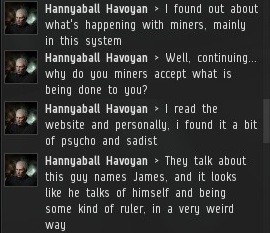 It took him five years to teach miners how to activate lasers and go AFK? Every system touched by the loving hands of the New Order has become a beacon of hope and freedom for the rest of the EVE community. 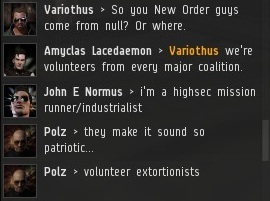 Agents of the New Order, all highsec is watching! 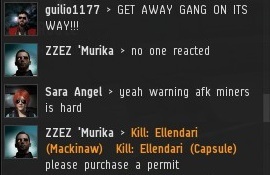 Aside from seeing bot-aspirants blow up in the belts, the one thing that really bothers the rebels is seeing so many of their fellow miners buy permits. At least, that's the impression I got from Averill Stardust's complaint. On the other hand, the kids these days use "sick" as a compliment sometimes. In either case, the New Order shall not rest until we achieve 100% compliance! 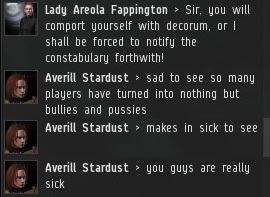 That name is just asking for CCP to censor it. That FACE is just asking for CCP to censor it. I was going to unsub 37 accounts until I heard that you were unsubbing. Now I prepaid them all for a year each, paying for it with profits from selling white powder at huge markups. I will in fact be attending Fanfest this year. I suggest that we meet up in Reykavik & share a bottle of red wine together whilst discussing our political differences like true gentlemen. Someone needs to get the "I Support the New Order" T-Shirts done and done in bulk to meet the demand. Alternatively a tattoo design would be nice, for all those awox spies that can't wear their allegiance full front and centre. 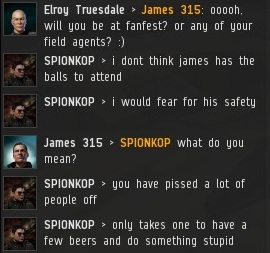 I would love for James to go to one of the fanfest meets, then I would love for miners to explain to the local police why they punched someone and issued death threats because they had to click approach again after being bumped and losing a couple of chunks of ice. Personally I would shake James's hand because although this whole New Order stuff isn't something I'd do myself and I disapprove of certain tactics, I applaud the initiative and the novelty and at least it's a more entertaining way to generate income than contract scams. I think New Order are playing a cunning game. Laying off the icefields to encourage more miners to return while their gankers have all but disappered in the attempt of foolng the resistance movements and getting New Order hunt squads to step down. I don't buy the rumours of internal strife, general failing, and low morale, brought on by James 315 withdrawing from CSM and increasingly effective resistance. Did the "resistance" ever do anything more than complaining in local? A couple people claimed to have helped foil an Orca gank yesterday in Outuni...or at least linked a kill mail in Kamio local claiming such. It had the Orca and 2 other ships (plus CONCORD of course) surviving and 7 NO ships being destroyed. No idea if it's legit or not. The KOTW seems to get better every week, if the Order can manage to get better and better kills while putting in less time, sounds like they're working smarter instead of harder. More likely that this Anonymous poster is merely speaking from ignorance, though. http://eve-kill.net/?a=kill_related&kll_id=16816643. I think this is the link to the Orca save. @11:57pm: Yes, that's the one. I take it some ECM was involved. 7 Cats probably wasn't enough for an Orca gank, so some of the other Cats were jammed and couldn't fire, and therefore weren't destroyed by CONCORD? Ah yes, the New Order is dying, EVE is dying, we're all dying in the Sylvia Plath sense of the word. Meanwhile more and more non-compliant Orcas and exhumers asplode. Alternate tattoos designs idea appear best on both arms.